The Huh? : Superman vs. Batman: Jason Momoa as Lobo? Doomsday? Martian Manhunter? Superman vs. Batman: Jason Momoa as Lobo? Doomsday? Martian Manhunter? It appears that Game of Thrones actor Jason Momoa is in talks for a role in Zack Snyder's Man of Steel sequel Superman vs Batman. I've seen it speculated that he could be Doomsday, but that is doubtful. In my opinion it would be a highly foolish move to do the Death of Superman before we care about the JLA, it would lose the impact of the loss of the team's leader and global symbol of hope. It's just plain too early to introduce him as a villain. There's also rumors of him possibly playing Martian Manhunter or Lobo, which are much more likely than Doomsday. Manhunter would fit with the Justice League set-up all the other news is hinting at. 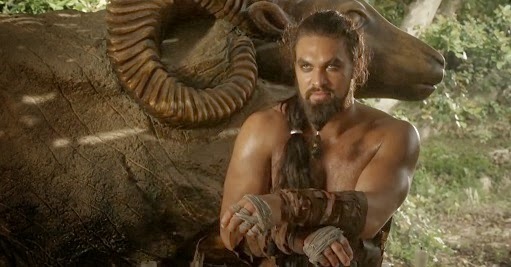 Although, I have to admit, Lobo would be amazing for comic relief if Momoa played him right. Space biker/Bounty hunter extraordinaire armed with a bunch of beer and expletives. What about Vandal Savage, Bizarro, Shazam, Black Adam, or the most recent incarnation of Brainiac? Has anyone guessed cosmic bad guy Darkseid? Perhaps DC movies is trying to copy the Avengers route with a hinted at future villain like Thanos in the Marvel films. It's going to be hard to care for these super heroes if we don't really know them. DC's film future seems a little too reliant on taking shortcuts to get all these well known comic characters crammed into one movie the big screen. The problem I see is with this is Avengers worked because all the main characters had individual films that built up to it- they didn't skip the steps- it was an earned alliance of titanic proportions. I believe DC's plans need more breathing room. Take the time to make something worth watching, not just smashing a bunch of names into a punch fest and hoping for it to work. It's only a matter of time before we hear if a new Green Lantern is named, or the Flash leaves a big screen blur across Snyder's sequel.